All African violet species and subspecies require moist and shaded conditions in their natural habitats. They often grow on steep rocks or in gullies, along the north side of shaded streams, or as undergrowth in dense submontane or montane rain forests. In most cases, the plants grow in the shallow soils covering rocks or in pockets of humus caught in rock outcrops or cracks. African violets can be said to be lithophytic, that is, they grow preferably on rocks, particularly on steep surfaces. The majority of African violet species grow on acidic, metamorphic gneiss or granitic rocks with pH down to 4.8. A few taxa grow on limestone rocks where the humus has been measured to a pH of 7.3. Generally speaking, most African violets can be grown in weakly acidic soils that have good drainage. African violet species grow at a wide range of elevations from near sea level to several thousand meters. The elevation of a taxa’s habitat should be considered when growing them in cultivation. The taxa from low elevations do well in warmer growing areas, such as the top shelves of plant stands. Other taxa such as Streptocarpus goetzeanus and Streptocarpus teitensis are from higher elevations and grow best under cooler growing conditions, such as the sills of north windows or the lower shelves of plant stands. Indeed, Streptocarpus goetzeanus will not flower unless exposed to conditions a few degrees above freezing. 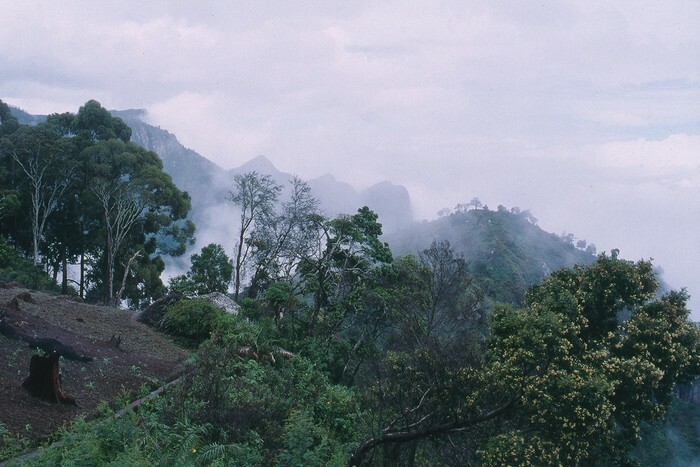 The Usambara Mountains, part of the Eastern Arc Mountains of Tanzania and Kenya, home of the wild African Violet. Photo courtesy of Charlotte Lindquist.